This entry was posted in Content and tagged 4 NZ Brigade, 44 R.T.R., Brigadier Inglis, Brigadier Watkins, New Zealand Division. Bookmark the permalink. Interesting article, thanks – it would be fascinating to see what the contemporary NZ documents said rather than a much later comment perhaps influenced by the subsequent less than brilliant relationship between the NZ forces and British armour in mid-1942. Interestingly, there is mention in the war diary of 1 Army Tank Brigade of a conference on the previous day (i.e. at 1630 on 25th Nov) at HQ N.Z. Div at which the Div. Comd announced that the div was going to capture BELHAMED, SIDI REZEGH and ED DUDA by night attacks on the night 25/26 Nov supported by 1 Army Tank Bde. It states that “the [1 Army Tank] Bde commander agreed that tanks might be used to assist the night advance provided they were moved in rear of the infantry and allowed to find suitable counter-attack positions in Bde reserve before first light, i.e. they were to contribute to the operation merely by the noise of tracks and to be tucked away out of observation before first light…Tanks alone could not attack in daylight without serious casualties and therefore new methods had to be tried”. The diary goes on the describe the operation with its tanks “noises off” (i.e the capture of BEL HAMED) as a success but that the tanks were caught in the open in the morning and suffered 7 tank casualties before reaching a covered position from “intense arty and A/Tk fire from SIDI REZEGH area”. An event which probably produced some tension between the two brigadiers (Watkins of the tanks and Inglis of 4 N.Z. Bde)! So it looks like the decision to use the infantry tanks in a night attack was actually made on 25th (and by the Div Comd) and perhaps it was just the phasing of the tanks and infantry that remained to be debated on the 26th Nov. That Freyburg called insisted the attacks should be night attacks by infantry supported by tanks is also interesting for a battle fought almost exactly a year later! I’ll be transcribing the army tank brigade in more detail over the next few weeks and will see if there is any more about these operations in orders or reports. Thanks for making me look, and good digging. WD NZ Div. confirms the conference on 25 Nov, at 1700, as a Bde Cmdrs conference. So Inglis would have been there. It is possible that Yeo got cold feet when told by Inglis that his tanks would lead, which wasn’t the deal Watkins had agreed to, and this brought about the kerfuffle? WD 4 NZ Bde also confirms the conference. Apparently there was a move planned in the morning of 26 Nov which was canned when Lt.Col. Yeo delayed moving off the tanks in order to get the instructions confirmed in person. “2115 Bn forms up for night advance to join our forces from TOBRUCH at ED DUDA. Order of March:- Composite Sqn (Comd. Maj Gibbon) to advance at Tk speed – Bn HQ + 2 Tps, to accompany one Bn NZ Inf at Inf speed. 2130 1st Tk Echelon advances, and arrives at ED DUDA at 2245 hrs. Strong enemy position was overrun and many enemy killed. Enemy A.Tk guns, Fd guns and M.G.’s encountered and destroyed. 2145 Bn HQ + 2 Tk Tps advance with Inf Bn. No enemy fire was encountered, all guns having been silenced by 1st Tk Echelon. This Echelon arrived at ED DUDA and established contact with 4 R Tanks from TOBRUCK. Many German + Italian prisoners were taken as a result of this action. I’m not sure that “cold feet” is fair – given the instructions he had from his Brigadier, the training the Bn would have undergone and the current Infantry doctrine I’m not surprised there had to be some persuasion applied! As for planned actions on the morning of 26 Nov – from the 44 RTR war diary it looks like they had a hard fight at dawn that morning, leaguering at 0730 (to refuel, resupply ammunition, do maintenance etc). Nothing after that until the 2115 hrs entry. From my perspective, the real tragedy is not this typical inter-arm, international bickering over “kudos” but that the 1st Army Tank Brigade war diary stated that “Tanks alone could not attack in daylight without serious casualties and therefore new methods had to be tried” and yet 1942 is replete with catastrophic British attempts to attack using unsupported armour in similar conditions. What happened to those lessons learned documents? Okay, I think I can see the confusion now Tom. 1 Army Tank Brigade WD clears it up. What you found refers to the night attack 25/26 November on Belhamed, which cost 44 R.T.R. seven tanks, eight men killed, three missing, and two wounded, when they were caught in the open. This was the ‘noise’ operation which had been discussed in the afternoon of 25 November at Div. HQ. The 2130 hours attack on 26 November is described in the 1 Army Tank Bde WD as “This was again a new conception as [to] the use of Army Tanks.” The WD then goes on stating that Watkins suggested the night advance by 44 R.T.R. 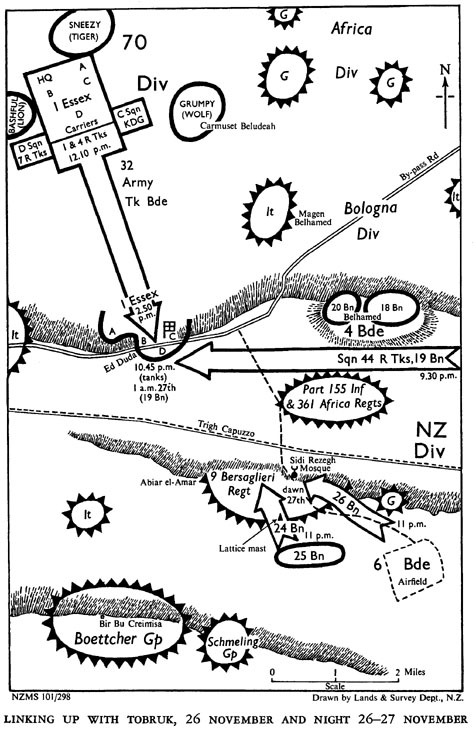 as the solution to the problem that the ground between the startline and the objective was full of AT guns and little artillery support was available. So we have a clear contradiction here.